Brainerd Lakes Area’s Best Auto Body and Prop Shop! Brainerd Minnesota’s finest quality auto & marine body, painting and prop repair and sales since 1974. Located across from the B.I.R. 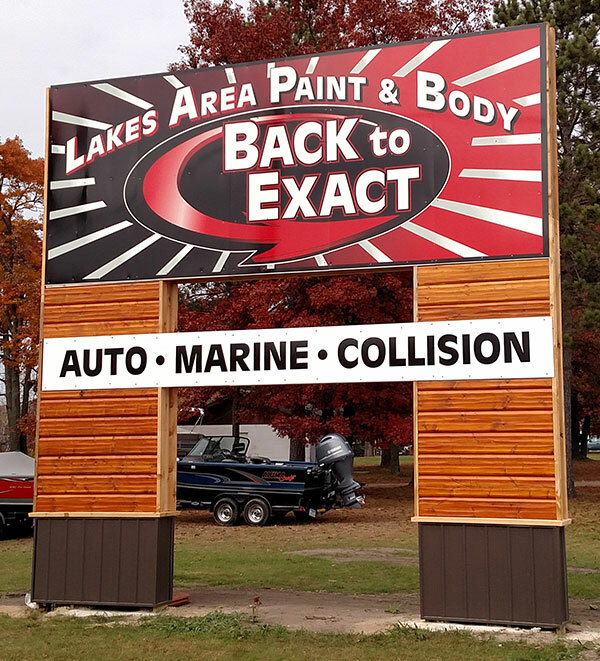 raceway in Brainerd, MN, Lakes Auto Body is your most convenient stop when in the north country. All mechanical, electrical, and safety systems to get ‘Back to Exact’. Sandblasting and painting for autos, trailers, boats, and more. Custom decal lettering and trim. Most repairs start immediately – quick turnaround time. Remember: You have freedom of choice when selecting a repair facility, regardless of your insurance company. Check out our convenient location and call us at 218-829-0141 for quick service from the area’s leading professionals.